LUZIRA – Express FC will have star-player, Tony Odur return as they travel to Maroons on Thursday afternoon in the StarTimes Uganda Premier League. 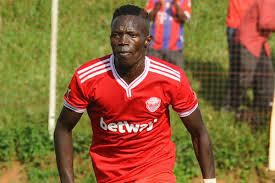 The Red Eagles striker who has been struggling for goals since the start of the season last featured in the 2-0 loss away to SC Villa. He missed the 2-1 At home to Nyamityobora last time out but has been confirmed as part of the team that will face Maroons on Match-Day 14. However, goalkeeper Arthur Kiggundu is not in contention as he struggles to find the required match fitness. His mate Mathaius Muwanga had his suspension revoked after he was cleared of match-fixing and is expected to start in goal. With two games left in the first round, the Red Eagles will be seeking to end it with a bang. “We have prepared extremely well for the game, said Express head coach Kefa Kisala. “We know it will be tough because Maroons are a good side with a very good coach. “With all that said, our target is to end the first round on a high and that is two victories in our last two games. The challenge which lies ahead will indeed not be smooth for the Wankulukuku Boys as they have lost both of their last two away fixtures in the League conceding three goals and scoring none. For Maroons, they head into Thursday’s game on the back of a thrilling 3-2 win away to Ndejje University, a game that required them to come from a goal down. George Best Nsimbe’s side have been showing signs of recovery from their early season woes, since signing a new sponsorship deal, winning two and losing one of their last three league games. Sitting in 13th, five points away from the drop zone, a positive result on Thursday will be a huge boost in their attempts to fend off relegation this season. This will be the 9th meeting between the two sides since 2010. In the eight between 2010 and now, Express has won 5 with Maroons triumphing on only one occasion. Last season, Express took four points off Maroons including a 1-1 draw in the reverse fixture. Maroons have won only three games so far this season (D4 L6). At home, they have managed only two victories since the season started (D1 L3). For Express, the come into the game having won only two of their last 7 league games (D2 L3). Away from home, they have won two, lost three and drawn one of their six games on the road so far this season.